Intuitive, authentic, and surprisingly realistic, Killing Floor: Incursion emphasizes the physical dimension of its virtual world, delighting in the tactile qualities of VR and making the most every little object. Whether you're staring down the scope of a remarkably believable sniper rifle or clobbering enemies with the dismembered arm of one of their own fallen comrades, you never fail to have a clear, satisfying sense of how every item, weapon or body part feels. Another failed attempt to get a traditional first person shooter working in VR, although the online co-op option keeps the novelty going for longer than it should. Looping back to the beginning of this review, we already have a solid stable of go-to VR shooters. Killing Floor: Incursion definitely makes it onto this list though, trails towards the bottom half. It's a great adaptation of the series but lacks longevity, mainly thanks to its reliance on using the same swarms of braindead cannon fodder instead of adding more diversity to its firefights. Killing Floor: Incursion is the classic example of first-person shooter capable of exploiting virtual reality in a brilliant way and offering a gameplay that goes beyond the typical VR shooter. Killing Floor: Incursion hits PSVR just a bit late in a lot of ways. It's arrival comes months after the PC release, which already felt pretty derivative of other VR shooters out there. If you're a fan of the property then the game might offer enough to justify a purchase. Otherwise it's just a standard VR shooter that doesn't go far enough to differentiate itself from the crowd. Killing Floor Incursion reminded me of the old Mr. Toad's Wild Ride at Disneyworld, in the way that it careened wildly from place to place, oscillating between thick tension and psychotic action, keeping me totally amused and off balance. From some of the best (and well-earned) jump scares I've experienced in a game, to one of the greatest boss fights in recent memory, Killing Floor kept me gasping and laughing for its entire duration. The tension ratchets unbelievably high, and the simple act of peeking around a corner can lead to coronary trauma when you realize that something is standing right behind you. Like any good rollercoaster ride, Killing Floor Incursion delivers the chills and the fun in equal measure, and is well worth the price of admission. A fun first-person action game this may be, Killing Floor: Incursion rarely serves as anything other than just that. Its fluid play style and control scheme make decent use of being able to draw, aim, and holster your weapons with realism and ease, though it's 4-5 hour campaign is often repetitive and lacks a little inspiration. If you're looking to slash and shoot your way through countless enemies or buddy up with a friend for a few hours for co-operative and competitive fun, Incursion is here and ready to serve, though we're not convinced it's current £24.99 price tag is a true reflection of what's on offer here. Killing Floor: Incursion is a pretty solid VR experience. The single player (or co-op) provides a great atmosphere. When it comes to getting the horror aspect to be actually horrific, Tripwire Interactive has done an excellent job. It's really that experience that sells it. Killing Floor: Incursion is easily one of the best VR shooters on PlayStation VR at the moment. There are the occasional missteps you find in VR titles, similar to how games were when motion controls were first introduced with the Wii. It's easy to tell that Tripwire Interactive put a lot of care and effort into this game, and because of that, it's an easy recommendation for any PS VR owner looking for a bloody good time. Killer Floor Incursion is a good VR shooter, but not the best in its category. Killing Floor: Incursion is perhaps everything you might expect from a first-person zombie shooter in VR. It checks all of the boxes, sometimes to its own detriment. While billed as a shooter, the guns are unwieldy in the most frantic of situations, which will see players bringing a knife to a Zed fight. Incursion isn't the kind of VR experience that's a must-play showcase of the best of virtual reality. It sits firmly in the realm of expected fare, armed with a few gimmicks that keep it entertaining. Longevity is maintained through cooperative play with friends and the ability to slap mutant zombies in the face with their friend's dismembered arm. Despite its problems, that's not really the type of experience I can say no to. Killing Floor: Incursion is a VR game that's so close to being good that it's upsetting how bad it actually is. Killing Floor: Incursion doesn't challenge the notion that shooting galleries are a shoulder-shrugging default for virtual reality. Any potential for dramatic tension and imaginative gunplay is squandered by repetitive enemy encounters, tedious action, and rudimentary objectives. Loud guns and roaring carnage are muted by Killing Floor: Incursion's nondescript comfort in inertia. While Killing Floor Incursion can be fun, its clunky controls get in the way of actually enjoying the game. 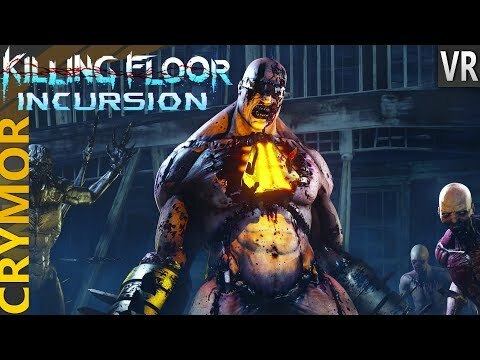 Killing Floor: Incursion fills a much-needed niche in VR horror by bringing cooperative play and engaging combat to their VR-native entry in the series. If you have PSVR do not sleep on this title. With very tight controls, an interesting enough story and just the right mix of action and puzzle solving, Killing Floor Incursion will keep you interested until the end, or possibly even beyond.